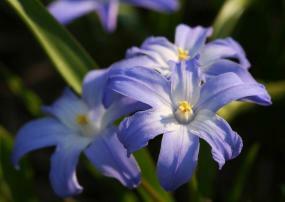 There are over ninety species in the genus Scilla, native to Europe, Asia, and North Africa. 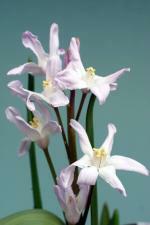 These small bulbs usually flower in early spring, although there are a few autumn-flowering species. They are known for their brilliant blue flowers. White, pink, and purple-flowered species can also be found. Siberian squill (Scilla siberica), native to Russia and Eurasia, is a popular garden species with blue flowers and blue pollen. Spanish bluebells (Scilla hispanica), native to Spain and Portugal, are also grown frequently. Not surprisingly, different species of scilla thrive in different growing conditions. Scilla siberica does well in locations as cold as zone 2. It has grassy foliage in very early spring, which dies back by summer. It grows well in sun or light shade. Siberian squill likes moist soil with good drainage and tolerates a wide variety of soil types. It does not tolerate dry conditions or hot locations. It can withstand light foot traffic when it is dormant. Spanish bluebell (Scilla hispanica) is a taller species which is particularly well-suited to shady areas. They are easy to grow and adaptable to a wide variety of light and soil conditions. Scilla peruviana is a good choice for warmer areas. It can be grown in zones 8 to 10. Scilla bulbs should be planted in early fall. The bulbs should be planted about six inches apart and two to three inches deep. Scilla can be easily propagated by bulb offshoots or seed. They naturalize readily in favorable conditions, and many have escaped from cultivation and thrive in the wild. Crown rot is occasionally a problem. Squills are often planted in masses to provide intense blue color. They are particularly attractive in rock gardens, woodland gardens, and meadows. They can also be naturalized in the lawn. A liquid squill extract is sometimes used as an ingredient in cough medicines. Gardeners have cherished Scilla, especially in woodland gardens, for centuries. To read the opinion that 19-century gardeners held of the plant, read Scilla.